During our trip to the new American Girl Store in Orlando, I got my first real look at the new BeForever line of dolls and books. I know they have been out for a few months now, but my resistance to change has kept me from them. Also, I read several blog posts and articles that said the new BeForever books were completely replacing the classic historical stories with modern girls. So in my denial, I stayed away from them whenever we visited the bookstore. 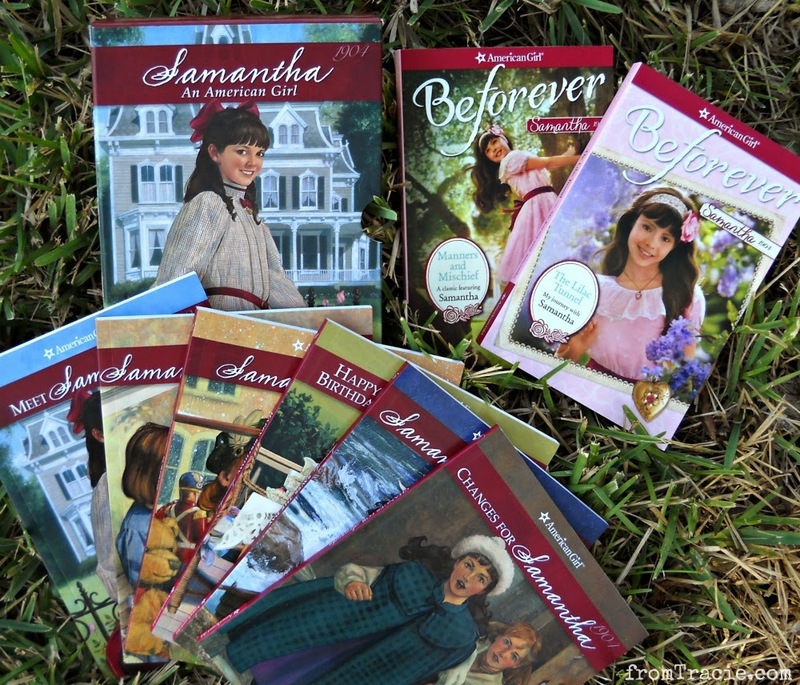 The only thing I was excited about was the news that the advent of BeForever would bring Samantha Parkington out of the archives. On Friday, I asked Stephanie from American Girl about the new books. Did I need to be prepared for heartbreak when I looked at them? She explained that the original stories are are not gone. Each girl's set of six stories have been compiled into two books. A third book has been added with a modern girl who travels back in time to meet the historical characters. This last book has a choose your own ending format, which has been popular for the last few years in American Girl's Innerstar University books. Manners and Mischief: A Samantha Classic 1 is the first three books of the original Samantha series and Lost and Found: A Samantha Classic 2 is the last three books. The new book is titled The Lilac Tunnel: My Journey With Samantha. The Lilac Tunnel is the choose your own ending book. It is cute. Samantha feels accurate, and it is always nice to get a new story with an old friend. I like that it is Samantha's locket that enables the girl to time travel. This is true for each of the new companion books - the modern girl travels with an object that is special to the original girl. It is a nice way to tie in the stories. Not accurate, of course, but what little girl didn't wish she could have traveled back in time to spend the day with her favorite American Girl? I know I did. I think this is also a nice way to connect the My American Girl dolls to the historical dolls. 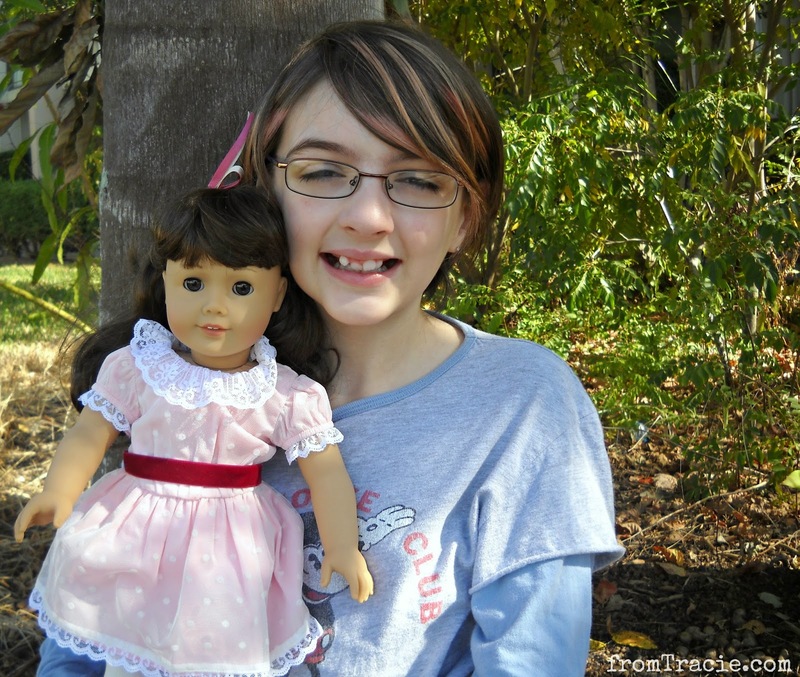 Your "look like me" doll can be the character traveling back in time to meet your historical doll. It is kind of perfect. Katarina came home from the American Girl Store with a Samantha doll and two of her BeForever books. We immediately sat down with our set of original books to compare. We read Manners and Mischief, and the text seemed to be mostly the same. There was one chapter in Samantha's Surprise that was split into two, but that didn't make any changes to the story itself. The idea behind the new BeForever compilations is to repackage them in a way that will appeal to girls today. The original books are quite thin for being chapter books. With three books in one, they feel more comparable in length to the chapter books most girls are reading. Along with the updated cover, it is a simple way to give them a more modern feel. This isn't really an issue for me. The combining of books also provides a savings. The original books were seven dollars a piece, and with the compilation you get three books for ten dollars. Even with the additional time travel book added in, the whole series has a reduced price point. That being said, there were some changes that Katarina and I did not love. Big change number one: no illustrations. Not a one. This is a real loss. Katarina was especially sad they didn't at least keep the little silhouettes that always graced the beginning of each new chapter. I was a kid. I know what it means to graduate to books without pictures. It is held up like a medal. Finally you have arrived to reading "real, grown-up books." Of course this is actually a very silly way to measure a book. A well-placed illustration is a gift. The illustrations in American Girl were especially lovely. And it was nice to have a representation of some of the historical objects from the stories. The illustrations were also what the doll's clothes, accessories, and furniture were based on from the beginning. Unlike every other illustration or cover art you have seen, the art and the book's descriptions matched each other down to the last detail. It was one of the marvels of American Girl. With the updated outfits and other items for the BeForever dolls, I am sure the old illustrations posed a problem. I don't think that was the entire rational for losing the illustrations, but it probably wasn't seen as a drawback, either. Big change number two: the lacking history section. At the end of every American girl book, there is always a Looking Back section which teaches you more about the time period of the girl. This is true even in the more recently written mystery books. In Manners and Mischief, the history section is only two pages long. Even accounting for the lack of pictures, this is very short. It comes no where near covering the amount of information that existed in the three original books' Looking Back sections. Instead, it is basically a shortened version of the historical information from Meet Samantha. This was very disappointing. The Samantha books are an important piece of American history, especially for girls. The original authors (Samantha's books had three authors - Susan Adler, Maxine Schur, and Valerie Tripp), did a great job working the historical issues into the stories of Samantha and the secondary characters. In Samantha's books you learn about the Suffrage Movement, child labor and factory conditions, the struggles faced by poor families immigrating to America, how the wider use of turn-of-the century inventions changed the way people lived and worked, and more. You still get insight into these things from the stories themselves, but the Looking Back section really gave you the full historical context. It was also a great introduction to reading history for enjoyment, making non-fiction more accessible to the average girl who might not otherwise leave the fiction section of her library. More than the loss of the illustrations, I am sad to see the reduction of emphasis on the historical aspect of the books. So what do I think of BeForever overall? I'm excited Samantha is back. 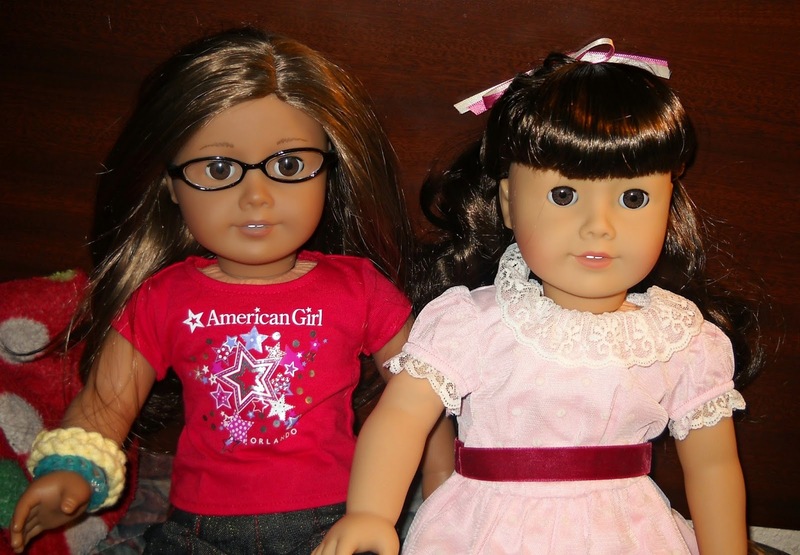 I am hoping American Girl will also return the other archived characters to us. Unfortunately everything I love won't stay the same forever. Companies grow and change with the times - even companies built on a love of detailed history. This isn't the first time the art and covers have been changed. The box set we own is certainly not an original. It looks more modern than the ones that were around when I was first reading them in the early 1990's. At this point, I'm just really thankful the historical stories are sill available. I was so sad when I thought they had been replaced, that I can't help but be relieved to see them. The core values and lessons they teach will transcend any art or formatting changes, as long as the actual stories are not altered. 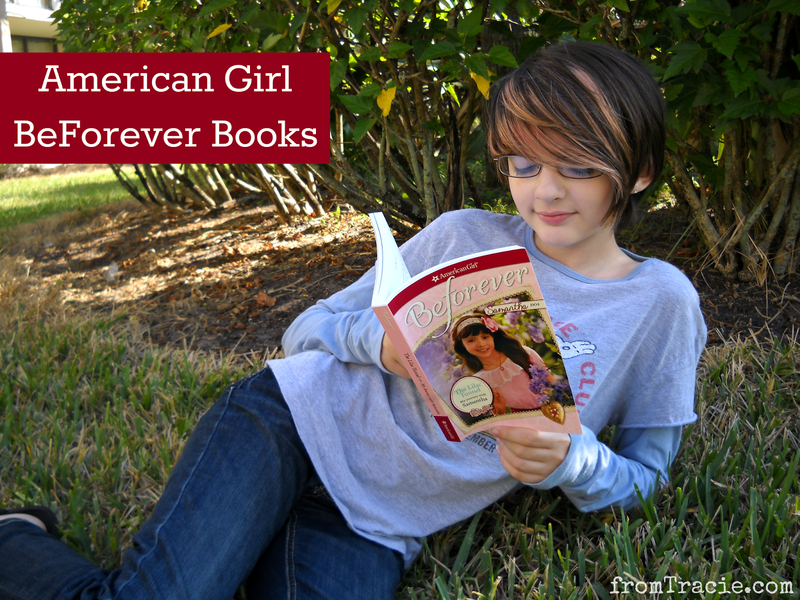 What do you think about BeForever and the changes to American Girl? 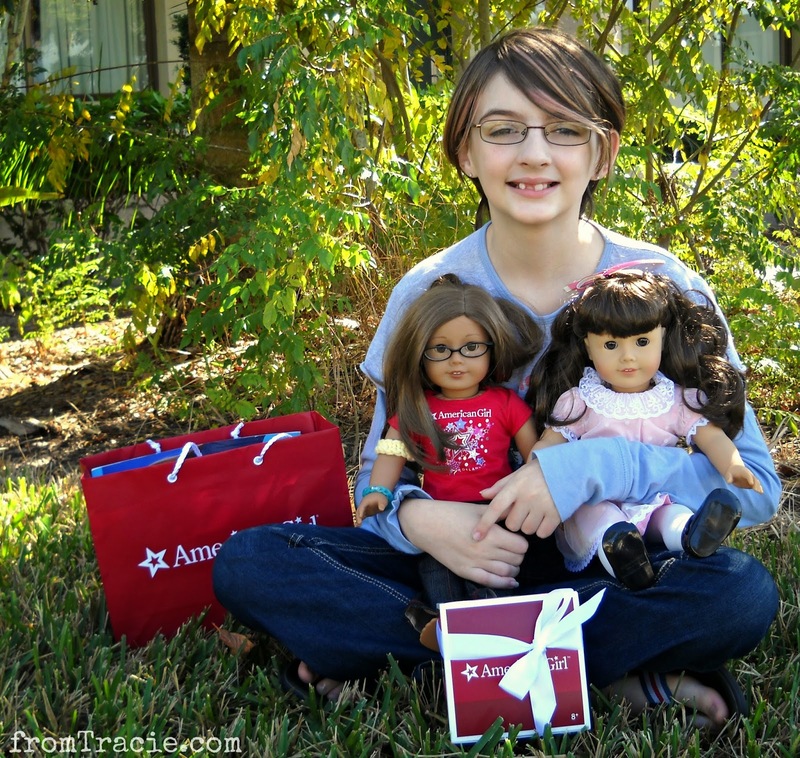 *As I disclosed in my post about the new American Girl store in Orlando, Katarina received a Samantha doll, books, and other goodies while we were at the store. I was not required to write this post or to spend a whole day rereading all of the Samantha stories. I admit I never read any of these books myself as I was too old by the time it was originally introduced, but am looking forward to with my own girls. So I do appreciate you sharing the diffs between the originals and these for when we are at this stage here. I never read them as a kid, but my daughter loves the books. I'm disappointed to hear that they're not doing as much with the history section in the new versions.